Jostar’s Top 8 Interior Design Projects — Jostar Interiors Ltd.
To say the Bearspaw project was huge would be an understatement. Jostar came in to upgrade the home décor and design by revamping the entire space – think new kitchen, bathrooms, and a completely overhauled main floor layout. Our clients were moving back into a childhood home, and bringing with them their modern taste and (three!) dogs that needed a home where they would feel relaxed and at ease. We worked around existing plumbing, and overcame tons of challenges with the older home’s building materials, resulting in a completely functional layout, brighter and more open spaces, and even a new island in the kitchen. We began this project in Devon with specific goals in mind, and a list of things we needed to fix – bad lighting, outdated finishes, lack of storage, and inconsistent design to name a few. We completely gutted the kitchen to open things up and bring the design up to current trends and standards. We changed the lighting, the flooring, and everything in between, resulting in a space that is bright and beautiful, ready for the homeowners to enjoy well into their old age! Custom drapery was the very first project we took on with this client, and we’ve worked with them throughout the 40 years that we’ve been in business. How do you take an outdated home and infuse vibrancy and convenience for a growing young family? We started this home renovation with a close look and the functionality of the design and dove deep to come up with design solutions that would last for years. One of the biggest highlights was completely opening up the kitchen – allowing for easy entertaining and maximizing the amount of space the whole family has to be together in this high traffic area. We created the Dahila showhome with a focus on glamour and consistency. We built a colour palette that we worked through the whole interior design, and created an overarching theme to be built into every room. Blended textures made the space really pop, and we pulled in a dark wall colour without making the rooms feel small or confining. 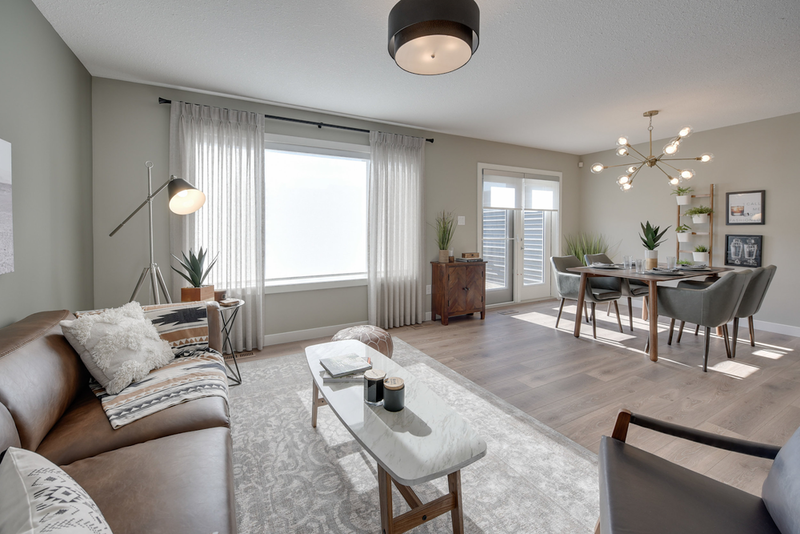 Modern minimalism was the theme in the Avalon showhome, and we used hues of monochromatic greys and whites to create a design that was anything but boring. Dark cabinets juxtaposed with light countertops added visual intrigue, and clean lines through the furniture and textiles added to a timeless modern look that we love. Warmth and cosiness were key factors in this showhome, and we wanted to bring elements of both nature and modernity together in one comfortable space. We used full grain wood, natural leather and thick-woven fabrics to create texture and make the home feel inviting. Greenery and plants throughout the every room helped bring the space to life – and we’re especially proud of the open concept layout in the main living area that would be ideal for families or anyone who loves to entertain. 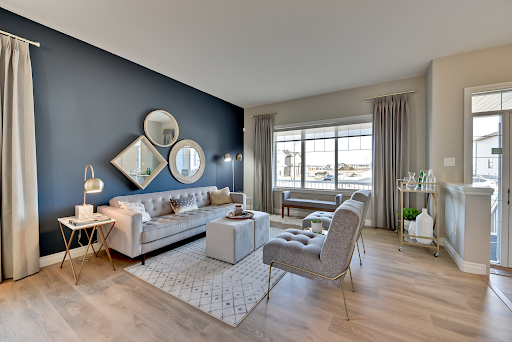 Mixing elements and styles is really what made the Gabriel II showhome come to life. An anything-but-boring home design calls for an interior to match, and we were up to the task. We paid attention to every little detail – from the grout in the kitchen backsplash to the shape of the fixtures to make sure this show home came together just so. Now that you have an idea of what we can do, it’s time to start imagining what your home could look like with our help. Wondering what it would cost to make your space look like one of these? Download our price guide to find out!